Soft Cover, 367 pages, 5.25 x 8.0. » This is the paperback edition of Citizen Coors: An American Dynasty. 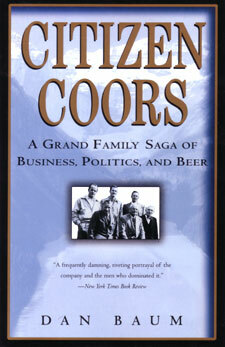 Citizen Coors is the riveting saga of an American dynasty. From the moment the destitute Prussian Adolph Coors stows away on a Baltimore-bound ship in 1868 to the worldwide expansion of the billion-dollar Coors Brewing Company, Citizen Coors is a headlong American tale of triumph over bare-knuckle competition. The Coors family does it the old-fashioned way, through fearsome devotion to product, rejection of modern marketing, and refusing to borrow so much as a nickel. But the family almost rides its principles into the ground. "Nobody will ever choose a beer on the basis of a thirty-second ad," Bill Coors is fond of saying at a time when his two main competitors, Anheuser-Busch and Miller,� are spending upward of a billion dollars a year on ads. He won't even allow a ring-pull can.� The brewery's decline and recovery are dizzying. But Citizen Coors is more than a business story. Here is Adolph, the founder,in 1929, distraught over Prohibition, hurling himself to his death from a hotel balcony. Here is Bill,ten years later, yearning for the wider world but forced back to the brewery by a single glance from his father. Here is Joe, Jr., raised to rule yet suddenly banished for marrying without permission. Here is Peter, prevented from rescuing the company precisely because he has been trained to do so. Here is kidnapping and murder. Here are generations of Coors men broken against the iron will of their fathers. Here is a second suicide, eerily similar to the first. Citizen Coors is finally a chronicle of how America was shaped politically in the last three decades of the twentieth century. For along with the Coors family's adherence to handshake integrity and old-world craft came some less roseate ideals from the nineteenth century: that disparity of wealth is proper, that government efforts to achieve social equality are illegitimate, that the Bible is the rule book for intimate conduct, and that capital must never bow to labor. The Coors family forever changed the American political landscape by creating the Heritage Foundation and a right-wing TV network, by financing the conservative shift in Congress, and by being early backers of a politically ambitious B-movie actor named Ronald Reagan. In retaliation, blacks, feminists, unions, gays, and environmentalists came together to bash Coors in perhaps the most effective consumer boycott of modern times--a boycott that continues to hobble the company. Based on more than 150 interviews, Citizen Coors serves up a powerful cocktail of beer and politics. Dan Baum, a former reporter for the Wall Street Journal, captures in this rollicking narrative the genius, eccentricity, and tragic weaknesses of the remarkable Coors family.With enough private dramas to put them on par with the Ewings of Dallas, and enough business crises to keep them constantly in the business hot-seat, the ultra-right-wing Coors of Golden, Colorado, represent one of the more riveting family sagas of our time. Their billion-dollar empire grew out of a single brewery begun in 1873, but it wasn't long before the family became known as much for their right-wing politics as their beer. The third generation of Coors men financed the birth of the Heritage Foundation, which jump-started the Reagan revolution. Old-fashioned about business and equally dubious of new ideas, they consistently ignored the importance of marketing until they were forced to, finally introducing the "Silver Bullet," and improved their image with unions and minorities only after they were compelled to do so by years of boycotts. Former Wall Street Journal reporter Dan Baum captures the eccentricity and foibles of this family and company in this fast-paced tale of vivid characters in business and politics.